Every once in awhile, a Hearthstone deck rolls around that’s so strong, so finely-tuned, and so effective, it’s hard not to play against it without getting at least a little bit salty. In the wake of the game’s latest Journey to Un’Goro expansion, that deck is called the Quest Rogue. Hearthstone’s main competitive mode, the one used by pretty much every major tournament, is called “constructed” mode, where players build their own decks and pit them against one another to climb the ranks. Your average Hearthstone player isn’t that great of a deck builder, so they “netdeck”—copy the best decks from the internet. Most established Hearthstone decks are named after their central mechanical themes. Quest Rogue, also known as Caverns Rogue, is a Rogue deck that hinges around a central card called “The Caverns Below.” The Caverns Below is a new Quest card that rewards you with a “Crystal Core” card once you fulfill its requirement of summoning four minions with the same name. Once you play the Crystal Core, each of your minions—whether on the board or in your hand—gets a 5 health / 5 attack stat line. In Hearthstone, this is considered extremely strong. Completing the quest of summoning four minions with the same name isn’t as easy as it sounds, mostly because you can only have a maximum of two of the same card in your deck. So the Quest Rogue relies on “bounceback” effects that bring minions back into the hand to be replayed. Before the expansion’s release, high-level players like Jeffrey “Trump” Shih thought it would be way too slow and inefficient to complete the quest without getting destroyed in the meantime. But once Un’Goro dropped, players discovered that it’s much easier to meet the quest requirement than most ever thought it would be, and the deck often snowballs to insurmountable levels at an early stage in the game. It does not feel good to lose to a Quest Rogue. Since they’re constantly pulling low-cost minions back into their hand until they complete their quest, facing off against a Quest Rogue player can feel like playing a game of solitaire until the fifth turn when they immediately fill the board with 1-mana 5/5s and destroy you. Since an estimated 99 percent of Hearthstone subreddit commenters post in the immediate aftermath of a salty defeat (I made that stat up but I think it’s true), /r/Hearthstone naturally exploded with complaints after the Un’Goro release, with players calling out the Quest Rogue’s non-interactive playstyle and obnoxiously strong quest reward. In TempoStorm.com’s most recent “Meta Snapshot” column, where they organize all the most popular Hearthstone decks according to how strong they are, Quest Rogue came in as a tier 1 deck, with the site calling the archetype “toxic” for the metagame. Shortly after the initial outburst, Dean Ayala from the Hearthstone design team defended the deck in an interview with Shacknews by saying it can be beaten by “aggro” deck archetypes, which are built to kill the other player as quickly as possible while they’re messing around with their homonymous minions. Or the “taunt” archetype, which puts up a wall of strong minions that are hard to push through efficiently, even for a Quest Rogue. As someone who loves to play Midrange Hunter, a deck that looks to snowball an early board lead into a quick midgame win, I tend to cut down Quest Rogues like they’re nothing. But whenever I stop playing Midrange Hunter (which I do often to avoid getting destroyed by Taunt Warriors), I find that the Quest Rogue tends to steamroll me pretty hard. This isn’t the first time we’ve seen a deck like this. Like the efficient, board-filling, burst-oriented Patron Warrior and one-turn-killing Freeze Mage decks before it, Quest Rogue actually takes a good amount of skill to play, since you need to know when to go for your combos and when to deal with threats that are already on the board. On top of that, the deck has around a 50 percent win rate, which typically means that it’s well-balanced. 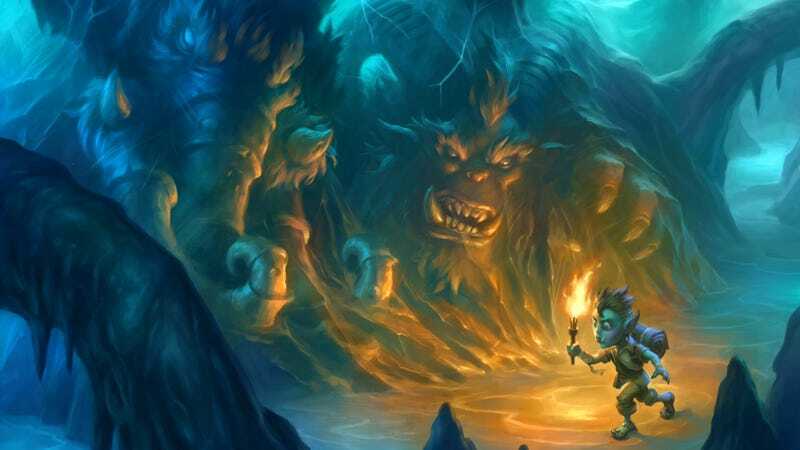 These are qualities that people typically consider positive for Hearthstone, but seem to be outweighed by the deck’s lack of interactivity—when you’re up against a Quest Rogue, there’s nothing you can do to stymie their efforts. It’s already been a couple weeks since Un’Goro first launched, and the Quest Rogue has evolved quite a bit since its early iterations. Instead of building up to quest completion and then simply flooding the board with 1-mana minions, the newest versions are more combo-oriented and seek to pull off massive swing turns so that the enemy player has even less time to respond to what’s happening. As people continue to find new ways to both play and counter the deck, expect Quest Rogue to continue to evolve. As it stands now, this is the kind of deck I love to see in Hearthstone: it requires some amount of skill to play, it’s not too expensive to build, it’s got distinct counters, and it doesn’t hold tyranny as the clear strongest deck in the game. If only it wasn’t so annoying to lose to.